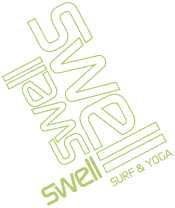 Kitesurfing is an exciting sport and at Swell we offer kite camps in cooperation with the best kite surf school in Cabarete, Dominican Republic. Here we will outline the steps that are involved in learning kiteboarding during a Swell Kite camp. "When was the last time you did something for the first time? " These are the steps you will go through when joining a learn to kite surf course, in Cabarete (or elsewhere). Learn to body-drag with one hand whilst guiding the kiteboard with the other. The kiteboarding courses Swell offers are done in cooperation with one of the longest running and most reputable kitesurf schools in Cabarete. We offer 6 to 9 hour kitecourses, generally accepted to be number of hours it will take to get you riding your first meters on the kiteboard. 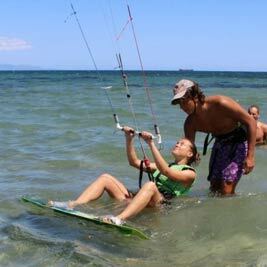 The most important part in learning to kitesurf is learning how to control the kite, this part of the kitesurfing course is done with a small trainer kite. Because the kite is small it will not generate a lot of power. However because it is small the kite is very fast and responsive and as a result the kite will punish any mistakes the student makes. Usually this part of the course take 1-2 hours. Once you have control over the small inflatable kite, your kitesurf instructor will move you onto a bigger (and more powerfull) inflatable kite. Since this type of kite is much more powerful, you will also be required to wear a helmet and an impact vest. Step 4 :Setting up an inflatable 4 line kite and explaining important safety aspects. Pumping the kite up and connecting the lines properly before launching are vitally important steps to flying the kite safely. Seems easy, right? But if you don't pay attention to connecting your kite lines perfectly, the kite will fly dangerously and result in an accident. Learning how to use the bar (attached to the lines) correctly plus the de-power system modern kites have, will help you control the power of the kite. It's crucial to understand and learn the 3 safety systems of the kite. Despite the differences between kites and brands, more or less, the security systems are the same. These safety systems will ensure you can get out of trouble quickly if something goes wrong, like a line breaking, lines being crossed if the kite flips over in the water and cannot re-launch, someone else getting tangled up in your kite lines, etc. During these beach kite lessons (as part of your learn to kite surf course), make sure that you have an excellent pair of sunglasses as you will be looking up into the sun for much of the time. You will be learning safe launching and landing within the 'wind-window' and how to keep the kite in a safe position whilst in the air. This is critical to understand as the kite often needs to be 'parked' in very stable position (often referred to as being at a certain o'clock) where it won't drag you, such as when you are walking along the beach, or coming in or out of the water. This is the really fun part. Once your kite instructor thinks you have enough control of the kite, he will let you enter the water with the kite. Your kite instructor will walk you to the edge of the water and walk into the shallow part with you. He'll tell you to put the kite into a certain position (often referred to as 2 o'clock) whilst you allow the kite to pull you through the water. Your kite instructor will tell you to move the kite between 11 and 2 o'clock. This action will move the kite into the wind-window and allow it to generate power. You will find yourself being dragged quite forcibly through the water, as the kite moves between 11 and 2, it will even pull you out of the water to some degree. It's powerful and exhilarating. Your kite instructor will let you do that for a couple of hundred meters before he asks you to move the kite into a position which will gently pull you back to the beach. You might ask how you can be communicating with the instructor whilst in the water. That used to be with shouting and gesticulation, but now, with the advent of the radio helmets all the good schools use, you can have the instructor talking you through each move. You will probably body-drag a few times so that your instructor is confident you can understand exactly how to generate power in the kite safely and more importantly, if you understand correctly how not to generate the power when you don't want it or need it. You will almost certainly dump the kite into the water at some stage. This is often when the power generated takes a student by surprise as it frequently does. Instead of stopping the kite at 2 o'clock, the kitesurfing student doesn't bring the kite up again towards 11 o'clock and the kite hits the water. Modern kites are really good at relaunching; their inflatable valves will make the kite bob along the water until it reaches a comfortable repose at the edge of the wind-window (don't worry about where that is at this stage; it will be the single most important thing you learn at the beginning of your kiteboarding lesson). Once the kite is on the edge of the window, it will want to pop back into the air. In this stage of your kite lesson, you will be taught how to position yourself up-wind of the fallen kite to re-launch. Occasionally, you can't re-launch the kite, perhaps because it has flipped. This is where a good IKO instructor will be on-hand to help you. Step 7: Learn to body-drag with one hand, whilst guiding the kiteboard with the other. The next stage of your kite lessons is to body drag again, but with the kiteboard in one hand. It's vital to learn to control the kite with one hand to be able to do this. Before you get to this stage, your instructor will likely have encouraged you to only use one hand to control the bar during your previous body-dragging exercises. So now, you have 3 things to worry about; keeping the kite at the required 'o'clock', hanging onto the kiteboard and getting into the water. It's not easy, so you will often put the kite into the water or lose control of the kiteboard; which is to be kept arms-length in front of you. 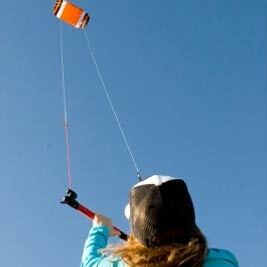 Luckily, the kiteboard is normally on a leash attached to your kite harness, so it can be recovered easily. It may take a few attempts, so don't be discouraged. Now comes one of the most frustrating stages of learning to kite. Putting your feet into the straps on the kiteboard whilst keeping the kite at the right position is quite possibly the hardest. You need to keep the kite at 12 o'clock. This is vital as in that position, the kite will not pull you in one direction or another. 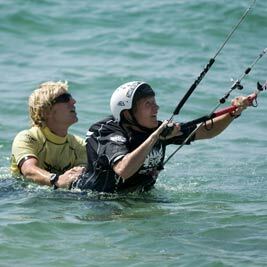 Being stable in the water is crucial to being able to pull the kiteboard around from the leash behind you and position it in front. If the kite is not at 12, but at 11 or 1, it will pull you right or left. This will make it impossible to get the kiteboard in the right position. Remember, you are controlling the kite bar (with the lines attached) with only one hand and it's easy to over-steer at this stage. It's so important to get that kite up at position 12 o'clock before you start to position the board. Again, it will take a few attempts; don't get discouraged. It happens to everyone the same way. Once the board is on your feet with the straps holding your feet in place, it's time for No. 9. So now you have the board on your feet and you are ready to ride. At this stage, you already understand and have experienced the wind-window and how it works. Once you are in the right position, your instructor will tell you to swing the kite to 11 o'clock and then fairly quickly down to 2 o'clock. This will certainly drag you out of the water, but the question is, will you do a 'super-man' (very common), where you are dragged right out of the kiteboard straps and fly a short time through the air before being dumped right back into the water, or will you make sure, following the crucial tips from your IKO instructor, that your legs are correctly positioned and your back is in the right pose, to make sure that it's the kiteboard which slides forward with you still attached. Some kiteboarding students are lucky enough to get this right the first time, but not many. 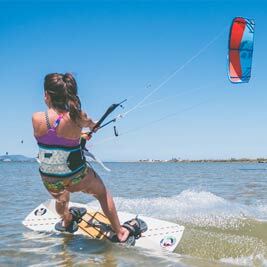 Normally it will take several attempts (including not using enough power – which will mean neither you or the kiteboard will glide) before you get the feel and can keep riding. It's all learning, even the mistakes. Once you are up, a common mistake is to be so exhilarated that you forget to move the kite back to 11 and then back to 2 and you lose power quickly, sinking back into the water. Your IKO instructor will be talking to you all the time, encouraging you to keep the kite moving. Hopefully, he or she will witness you heading out towards the reef with a big smile on your face. In reality though, unless you have some wind-surfing or sailing experience previously, your first few meters on the kiteboard will be bombing downwind at speed. You may have seen sailing boats 'tacking' at some stage. Tacking is required because of the way that wind works. It has a direction (in Cabarete, this is normally side-on, which means that whilst the wind is generally in the direction of the shore, it's also travelling from the right to the left). It makes Cabarete one of the best places in the world to learn to kite (quite apart from warm, Caribbean water). Imagine, a wind which is off-shore, or side-off; this would mean that the prevailing wind will keep blowing you away from the island. A side-on wind does the opposite, so even when you have dropped your kite in the water, Cabarete's prevailing wind will bring you back to shore. So, to tacking. The objective is to ride 'up-wind' which means not losing any ground and returning to the same place you first launched. As kiteboarders, we all remember the first time this happened in our learning curve. It's momentous (the kiting equivalent of a hole-in-one at golf). Again, imagine if you keep riding down-wind: You've set up and launched at LEK for example. All your stuff is there, so naturally, you want to end up there too. To do this, your kite instructor will explain you need to 'edge' the kite board. That effectively means leaning back hard and turning your toes up with your heels digging in, so that the kiteboard slices through the water rather than skimming flatly over the top. In doing so, you will be able to ride 'up-wind' and in Cabarete, that means out towards the reef. Once you've made it to the reef. It will all be about turning round and coming back. The good news, is that you will most likely be on a twin-tip board which means a board that can travel in either direction. Coming back at first normally means sinking down into the water to come to a safe stop before changing your angle with the kite once again at 12 o'clock. Then you'll be moving the kite from 2 to 11 (the exact opposite of what you did to tack out). In a later article, we will address more advanced kite lessons (transitions, jumping, riding a directional kiteboard, riding strapless etc.). We liken learning to kiteboard as trying to put 20 pieces of a blank jigsaw together. At times, it seems as though you will never get it, but then suddenly all the pieces fit together and you are a kiteboarder! a) Because things can go quickly and badly wrong with kiteboarding when you are in the wrong hands, resulting in serious injury, always learn with an accredited IKO (International Kiteboarding Organisation) school. A good lesson is one-on-one (i.e. one student to one IKO coach) and uses top of the range equipment. This type of lesson will normally start at around $72 USD per hour but gets cheaper the more hours you take. b) Don't complain about how 'expensive' kite lessons are; with a good school, you are using approximately $3000 USD worth of equipment in your kite lesson and you have your own instructor. We've already addressed how many times a student crashes the kite; irreparable damage is often done in a crash and a good school will not charge you for replacement of the kite (by itself, often valued at $2000 USD). c) Make sure your travel insurance policy will cover you for kiteboarding (it's considered an 'extreme sport' on most policies). d) Wear a really good water proof sunscreen and don't forget your feet, backs of your legs, etc. We've seen some horrible sun burns after a day on a windy beach where you are in and out of the water and don't feel the real strength of the sun. Most people can only cope with 2 hours of kite lessons each day: It's very tiring. e) Invest in good sunglasses. There are specialist kiteboarding sunnies on the market, with straps so that they can be worn even whilst in the water. LEK sell them in their kiteboarding shop. f) Buy yourself a good long-sleeved lycra (rash guard) and a pair of boardshorts. Don't kite just in a bikini or a pair of speedos. As mentioned previously, a good school will have you in an impact vest and helmet. The kiteboard harness can rub on the skin so the rash guard will help protect you from this (hence the name). 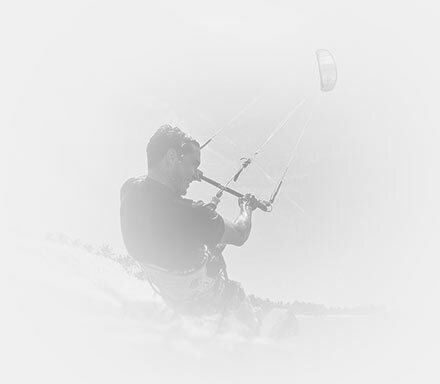 If you are interested in our learn to kite camp, have a look at our detailed kitesurf packages. Remember you are never too old to learn something new, so why not join us on a learn to kite surf holiday these coming months?